Is one of the most unpopular politicians in Britain’s modern history trying to make himself even more unpopular? 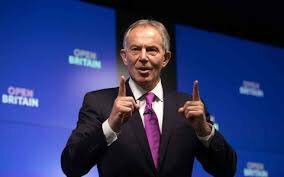 Despite a referendum vote by the British public, and an overwhelming vote for the Notification of Withdrawal Bill in the House of Commons (498-114) to leave the EU, former Prime Minister Tony Blair is intent on subverting the democratic process. He is agitating against the Brexit vote by calling upon those who want to remain in the EU to “rise up” against the majority (17.4 Million) and by egging on the unelected House of Lords to amend a bill that was smoothly passed by the elected Members of Parliament. The House of Lords is a controversial body that he himself fundamentally altered. 190 Peers are set to speak on the bill and 20 Peers are expected to press to amend the Bill. Flynn Resignation : The US Deep State Back in Control? Whistleblowers are an important tool for countering corruption, but politically motivated operatives dug in as civil servants should be uprooted from government. 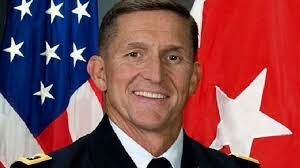 On Monday, Donald Trump’s National Security Advisor, retired General Michael Flynn, resigned after just 24 days into his government post. He had no intention to resign. In his final hours, he gave a revealing interview to the Daily Caller which was eerily published, after he had submitted his letter of resignation and stepped down, revealing the ghost of a leaky shadow in the United States government. His departing gift to the American people was to expose what may be an activist impulse, or an organised apparatus within the Civil Service. North Korea predictably set off yet another warning shot of its developing nuclear missile program. President Donald Trump gave a simple response, “I just want everybody to understand and fully know that the United States of America stands behind Japan, its great ally, 100 percent.” Mr Trump was at his club, Mar-al-Lago, where he was hosting the visiting Japanese Prime Minister Shinzo Abe when staff brought news to their dinner table from United States Strategic Command of a “medium- or intermediate-range ballistic missile,” tracked over North Korea and into the Sea of Japan. This was North Korea’s first missile test since the new President’s inauguration. 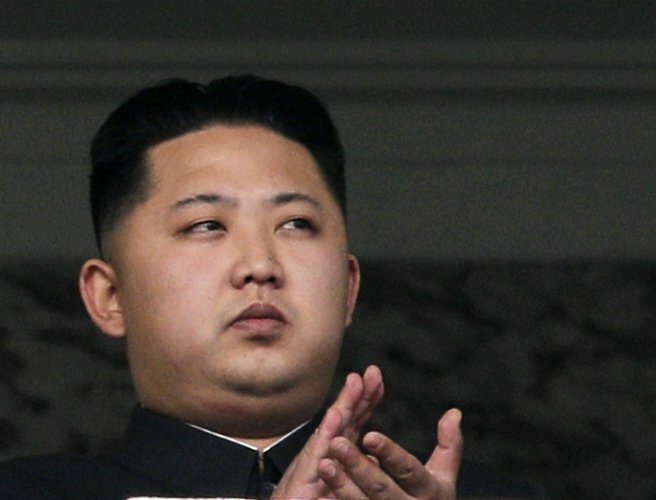 It was predicted by the Council of Foreign Relations that North Korean leader Kim Jong-Un would test the new president with a missile launch within four weeks of taking office. Unlike North Korea previous missiles, the Pukguksong-2, a road-mobile on tractor-erector-launcher units missile, is described by military analysts as a game-changers as it is powered by a solid-fuel engine – probably using ammonium perchlorate – is that the fuel is extremely stable, can be easily stored and the weapon is ready to be fired virtually immediately, making it harder to detect and neutralised before launching like liquid fuel missiles which takes much longer to move mobile fuelling wagons to fill tanks making it easier to detect by satellites before launching. North America Editor Kate Burrows-Jones explains in detail the Administration (Department of Justice case ) and the counter argument put by the Washington State Attorney. 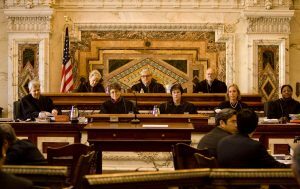 In an emergency motion, arguments were heard last night by the 9th Circuit Court of Appeals whether to uphold or turn a lower court decision by Seattle Federal District Court Judge (Justice) James Robart which had previously placed a restraining order against President Donald J. Trump’s Executive order banning travel from seven countries. The court ruling is not expected today. Judges ( justices) Clifton, Canby and Friedland presided by telephone and were Live-streamed to the public in a conference call with the Government’s Special Counsel for the Department of Justice, August Flentje, and the plaintiff, Noah Purcell, Solicitor General for the State of Washington in the case of State of Washington and State of Minnesota v. Trump. Live streaming from the 9th Circuit court of Appeals At 23:00 GMT – United States 6pm (18:00) EST tonight, there will be a critical juncture in the Trump administration’s leadership. 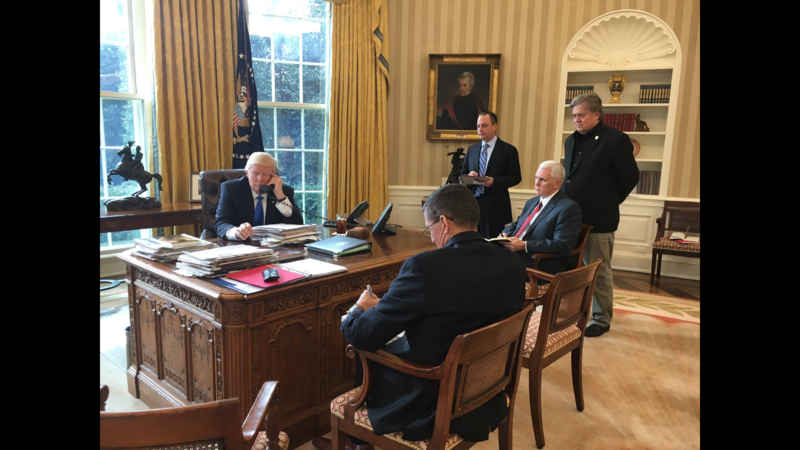 Team Trump’s power will be on trial, battled out in a hearing over his executive order banning travel from 7 countries. In the State of Washington & State of Minnesota v. Trump, each side will have 30 minutes to provide supporting arguments, by phone. The case will be heard by phone by three federal judges. The judges are Carter appointee, William C. Canby Jr, Obama appointee, Michelle T. Friedland, and George W Bush appointee Richard R. Clifton. Attorney Generals in 15 states and Washington DC sent in a memorandum arguing the ban hurts state universities and medical institutions. The system works, but it doesn’t. We have seen how an executive order can be successfully challenged by the courts, which is a victory for democracy, except……Unfortunately, the San Francisco 9th Circuit, also know as the 9th Circus, is stacked with activist judges and has an extraordinary 67% rate of reversal. The president put in play an ill-conceived order, which he did not sell well to the public. The press didn’t read the order and jumped on the ‘Muslim ban’ bandwagon. The courts appear to have overturned it less on merit, than on politics. We the American people lose. What happens if we are faced with a real emergency? Has a precedent now been set that the Executive can’t impose a ban on certain immigrant and refugee groups. The most recent one is similar to a more isolated one President Barack Obama put in place to reaction to gaps in security screening brought to his attention by the FBI? 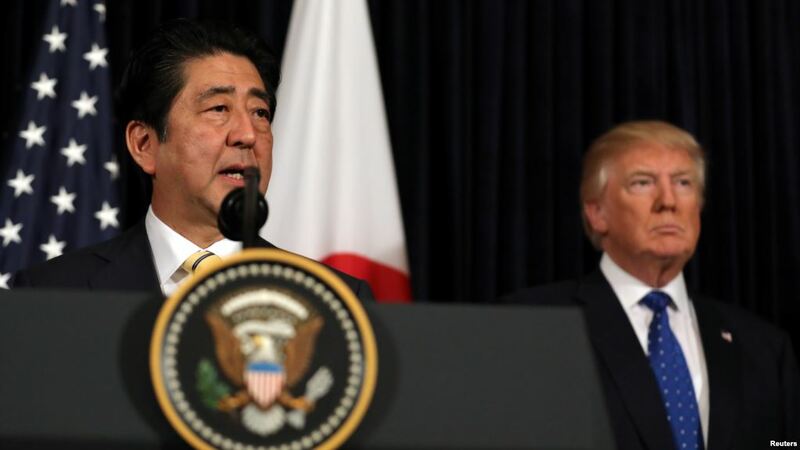 The United States Treasury Department today leveled a New Set of Sanctions against Iran in response to to the Islamic Republic’s new medium-range ballistic missile testing. The American Administration says there is no impact on the 2015 Iranian nuclear deal, the Joint Comprehensive Plan of Action JCPOA. HM government published an official policy document setting out its Brexit plans; known as “ The White Paper” which opposition MPs and the remainers have been urging The Prime Minister to do. The White Paper, a 77 page document in dark grey rectangle on the front page, lays out the government’s 12 “principles” , previously spelt out by Mrs May in her Lancaster House Speech last month, including migration control and “taking control of our own laws”. The paper presented by David Davis MP, The Secretary responsible for leaving the European Union who said the country’s “best days are still to come”, outside the EU. The Opposition labour party Labour criticised the White papeer as “says nothing” and had been produced too late for “meaningful” scrutiny. The link to the Full text printable (77 pages) in pdf format or a web version. 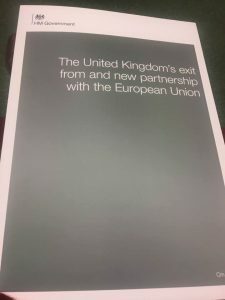 The White Paper, officially known as “ The Uniteds Kingom’s Exit from, and new partnership with, the European Union White Paper” sets out the themes of the government’s objectives to reach by negotiations with the EU. NO TEA FOR TRUMP? MPS DEBATE BANNING THE PRESIDENT. AGAIN. A petition signed by over one million, among whom 800,000 are British, will require MPs to discuss whether US President Donald Trump should be banned from a state visit. Any petition presented to parliament with over 100,000 signatures is automatically debated by MPs. The anti-Trump petition will be debated on Thursday, February 20th at Westminster Hall not in the main Commons Chamber. The MPs will also debate another petition, signed by half a million people and put up on Monday night, welcoming Mr Trump to the UK. The outcome of the debate only carries moral weight but has no effect on Government policy. A Sky News poll said 49% of Britons believe Trump should stay home.